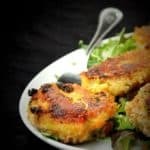 A Vegetable Cutlet is a delicious and healthy fritter made with a mish-mash of potatoes, carrots, peas, and green beans. It makes a perfect snack for kids and adults. It's soy-free, nut-free and vegan. Boil the green beans and carrots until tender but not mushy. I do this by putting them in a bowl, adding about 1/4 cup of water, and zapping them, covered, in a microwave, about five minutes on high. Drain all water. Heat oil in a skillet. Add the cumin seeds, and, once they sputter, add the onions and ginger. Stir-fry the onions for about a couple of minutes until they start to soften. Add the chilli and turmeric powders, stir into the oil, then add the peas, carrots, and green beans. Cook for another two or three minutes until they are quite tender. Stir in the coriander leaves. Place the cooked veggie mixture in a food processor and pulse three to four times for five seconds each. You don't want a paste. Some bits of the veggies should still be visible. Add the veggies to the mashed potatoes and stir well together. Add salt to taste, and lemon juice. Turn off the heat and stir in the flour. Heat a cast-iron or non-stick skillet. Spray or spread on a film of oil. Take a 1-inch ball of the potato-veggie mixture and flatten it into a disc. Dip the cutlets in the chickpea-water mixture to coat on both sides. Then dredge them in the bread crumbs crumbs so you have a fairly even coating on both sides. Place the cutlets one by one in the hot skillet, without overcrowding. Cook on each side until golden-brown. Serve hot with ketchup or chutney. Recipe can be made glutenfree by substituting rice flour for the all purpose flour and using glutenfree bread crumbs.